This weekend didn’t go quite as I planned. 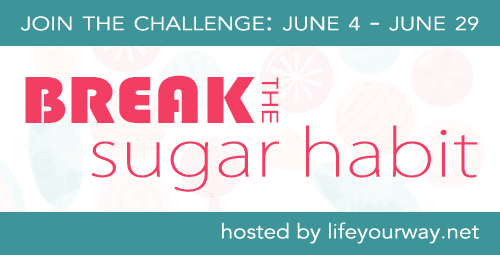 We were out of town Friday through Sunday and while I hoped to have some time to gather my thoughts about meals and strategies for this week, I ended up doing it in bits and pieces instead, which is making me feel pretty scattered as we launch the Break the Sugar Habit Challenge today! I also started my meal and snack lists below, and I’m going to keep adding to these lists as we go so that they’ll last throughout the four week challenge without everybody feeling deprived in the process. We’re trying to approach this challenge from a positive perspective. Rather than just talking about all things we can’t have (although that’s an important part of the conversation), I also want to make sure there’s plenty of emphasis on what we can have and on strategies for when sugar cravings hit. Although I didn’t have time to fully gather my thoughts over the weekend, my first strategy was simply to fill my cart with tons of yummy fruits and veggies. As a side note, I know that some people eliminate fruit along with sugar in order to help break the sugar cravings, but I just can’t bring myself to do this, especially since my girls are participating in the challenge with me. Instead, we’ll be eating lots of fruits and veggies — while being conscious of how often we’re adding “sweetness” to various meals — as part of our challenge. One of the most challenging parts of the next four weeks, for me, is going to be eating out. We’re not very good at packing meals and snacks for the road, and I know the temptation to grab something while we’re out is inevitably going to hit at some point. Because there are very few “safe” packaged foods, my plan is for us to stay home for most of this week and spend the week strategizing easy “on-the-go” meals and snacks for the future since we obviously can’t stay home forever. 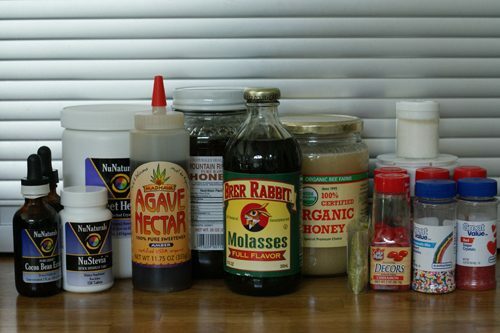 These items are part of my strategy for enjoying things like pancakes without syrup or oatmeal without honey as well as dealing with sugar cravings. I’m keenly aware that this first week will be especially challenging for our family as we give up sugar. Because sugar is addictive, our bodies will crave it more as we go through withdrawal, and I’m expecting that we may also experience some low blood sugar issues. I’m debating using clay water or capsules as well to help my system detox as well, but I need to research that some more before I make a decision. And now, here is the beginning of my meal & snack lists for the week. I was pleasantly surprised to realize that snacks are going to be the easiest part of this challenge, since that was the part my husband and girls were most worried about. We’ll be eating lots of roasted veggies and using homemade condiments with our dinners, but I’m less worried about what we can eat — since most of our dinners tend to be fairly sugarless already — than watching out for the things we shouldn’t be eating. Melt coconut oil in a skillet on medium while you slice your apples (I usually leave the skin on). The size of your slices doesn’t matter as much as ensuring that they’re all about the same size. Add the apples to the hot oil and sprinkle very generously with cinnamon. Stir often, adding more cinnamon and coconut oil as necessary. 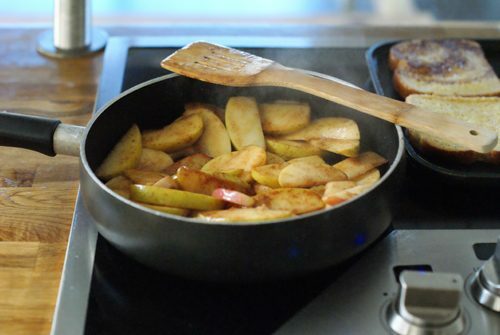 When your apples are soft but not yet mushy, remove them from the heat and serve over pancakes or waffles or all by themselves! 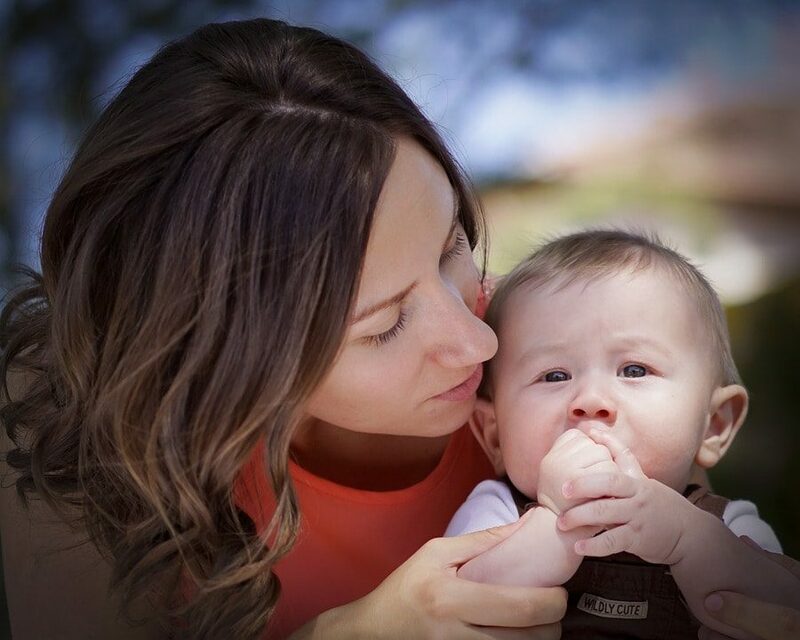 Amy from Keeping the Kingdom First is approaching the challenge a little bit differently than I am, so head over and read about her strategies as well. Be sure to check back on Wednesday, when I’ll be sharing a ton of resources – including other people’s strategies and recipes – to help you tackle this challenge! If you’re participating in the Break the Sugar Habit Challenge, how are you feeling? Do you feel prepared? Are you excited or nervous?